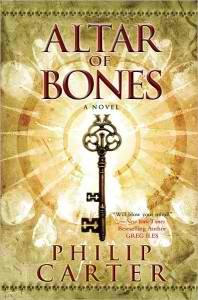 Altar of Bones is the first novel by Philip Carter, a pseudonym for an author who is "internationally renowned", according to the cover flap and the author description on Fantastic Fiction. At first glance, Altar of Bones seems like another 'Da Vinci Code '-type adventure in which contemporary beliefs and mores clash with ancient secrets and truths. However, Altar of Bones is nothing like what you would expect -- especially if you use its position on the bestselling list and its cover art to come to whatever predetermined conclusion you may have. In other words, it's not just another Da Vinci Code copycat -- but wildly original and shocking! The novel combines several main characters and story-lines that connect in the most astonishing way by the end; including the mystery of a homeless woman's true identity as she runs from an assassin, a shocking confession from an old man on his deathbed who mumbles nonsense about "The Big Kill", and a story of how the daughter of a powerful Russian mafia boss makes a few surprising discoveries about her past. These plots are all birthed at a Russian concentration camp in the late 1930s, when a woman takes her sick lover to a secret spot in the mountains known as the "Altar of Bones" to not only escape their impending deaths but also to cure him. Basically, everyone in the novel is out to either protect or locate this powerful "Altar of Bones", which is rumored to be a fountain of youth or source of eternal life. Not only is the mysterious power behind the Altar of Bones intriguing enough to capture your interest but midway through the novel, Carter introduces a more complex plot that will surely excite conspiracy theorists. The overall plot of Altar of Bones is definitely a guaranteed ice-breaker and great conversational topic -- not only for the conspiracy theories but also for discussion on the very modern and scientific explanations behind the workings of the Altar of Bones itself. Altar of Bones is absolutely worth your time! All readers will love it no matter what your favorite genre may be and the suspense alone makes the novel a page-turner, not to mention the creativity and complexity of the plot. Now if only I knew who the real Philip Carter is, so I can dive into their other novels! Has anybody else read novels like this that are similar to Dan Brown's The Da Vinci Code, but much better? Does anyone know the true identity of Philip Carter?